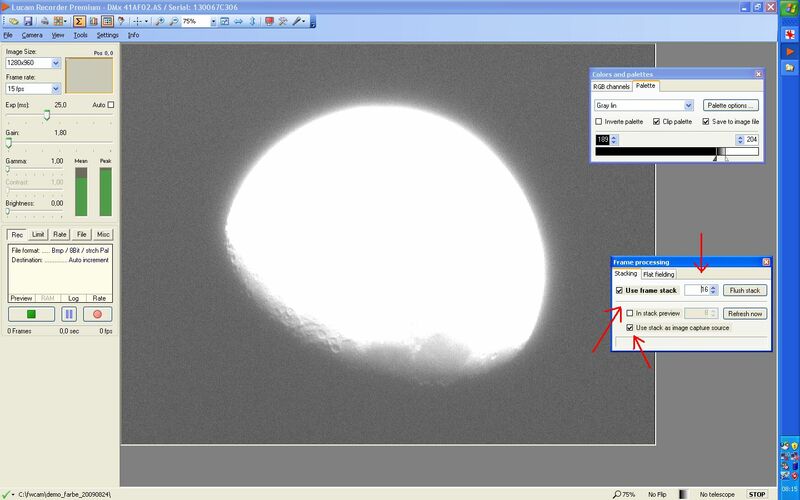 This page demonstrates the special version of the Lucam Recorder software for Contrast enhanced live observation of celestial objects. A good example is the observation of the moon during daytime. 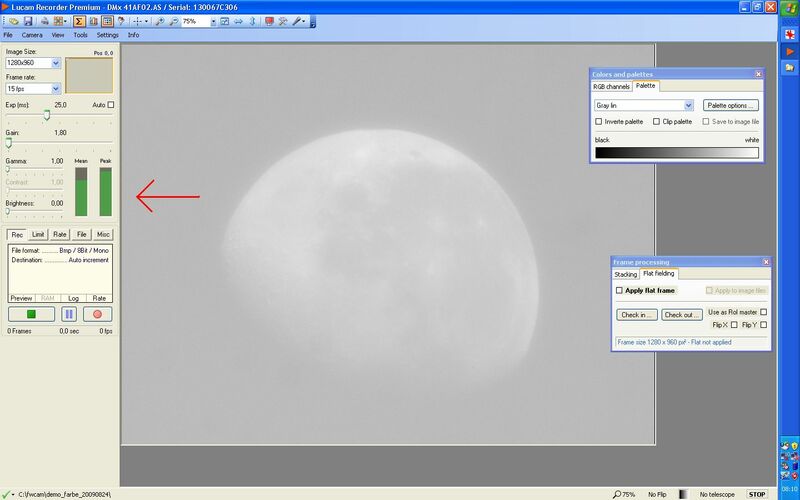 The moon was observed in broad daylight, with the sun 20° above the horizon. A blue filter was used to deliberately lower the contrast and so better demonstrate the capabilities of the software. 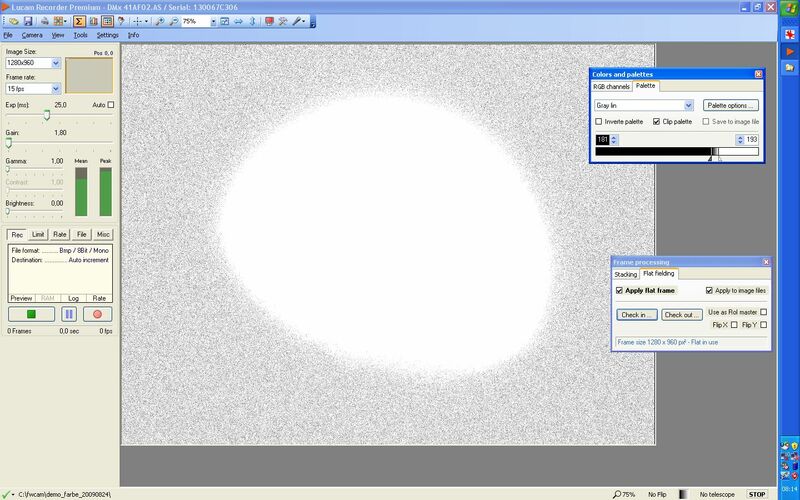 The exposure is adjusted, so that no part of the image is overexposed. 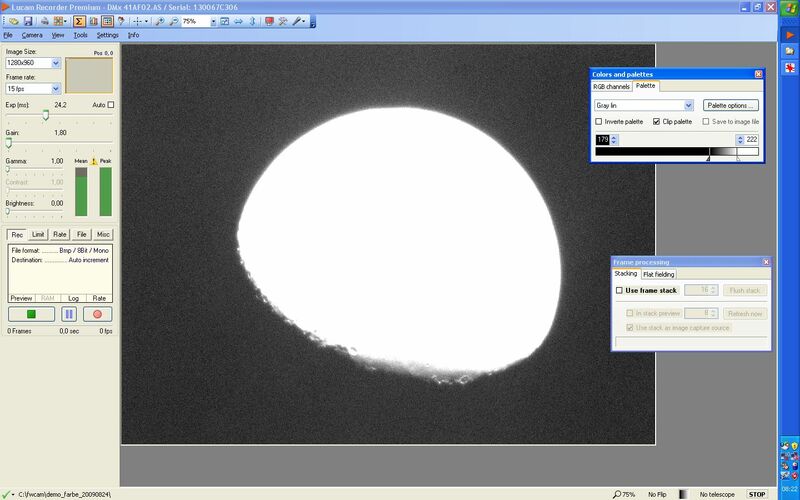 Contrast between the lunar disk and the background is quite low. 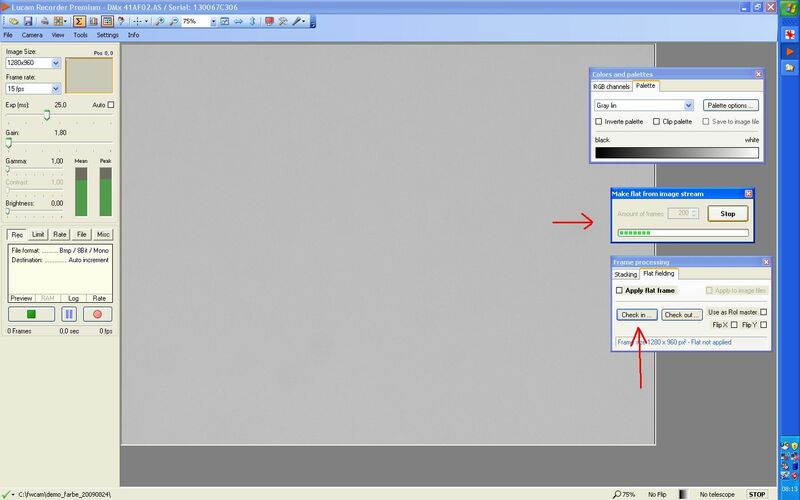 The special real-time contrast-enhancement feature ("palette-clipping") of the Lucam Recorder was used to increase the contrast. 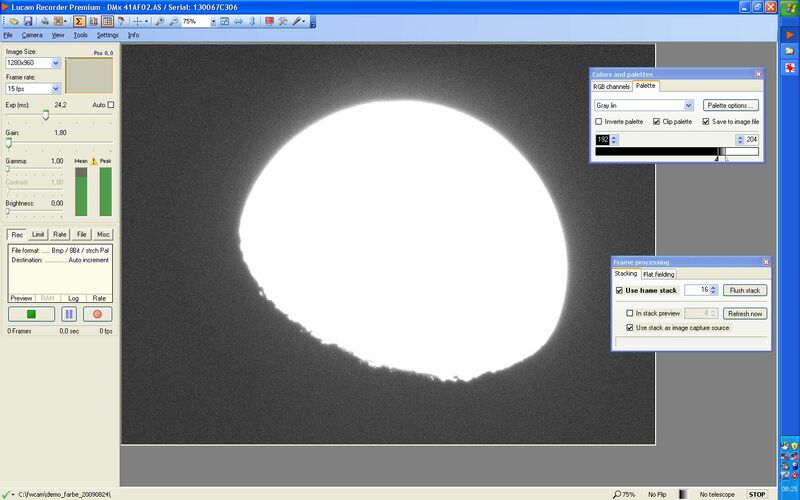 The sliders were adjusted, so that all of the lunar disk is properly visible. Dust shadows and other irregularities also become visible. The noise in the image becomes more visible, too. The sliders were adjusted again, (moved closer together), for maximum enhancement, to show the shadow edge of the lunar disk, the lunar terminator. Dust shadows, irregularities and noise are very dominant now. 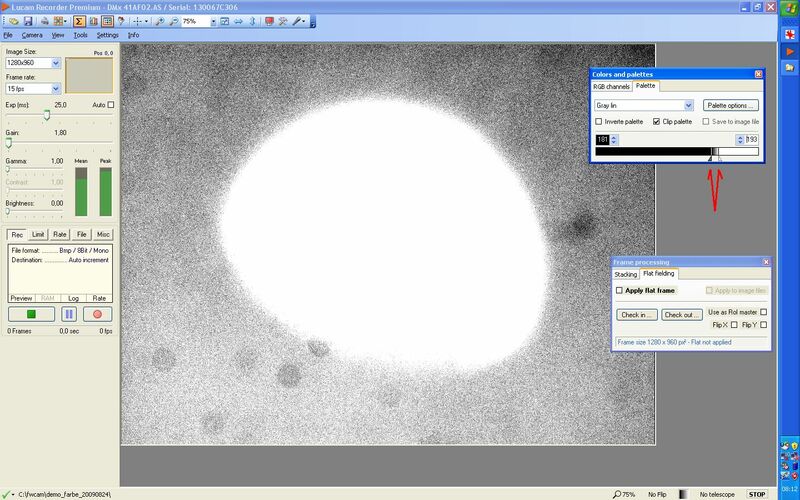 The Lucam recorder can capture and apply a flat-field, to remove dust-shadows and irregularities. The flat-field is generated from several hundred images of the image stream, after moving the scope off target, to a uniform patch of sky. The scope could even be moved while the flat-field-images are captured, to provide a more uniform illumination. The generated flat-field is applied to the heavily contrast enhanced image. Dust shadows and irregularities are gone, but noise is still very visible through the contrast enhancement. The Lucam recorder can stack images in real-time to reduce noise and improve the visibility of low contrast detail. Images can be stacked, to reduce noise and bring out faint detail along the lunar terminator. This must be combined with the use of a flat-field for proper effect. Stacking 16 images a 15fps gives an effective frame rate of about 1fps, which is good enough for live viewing. Cameras with higher frame-rates can stack more images, if the exposure time is short enough. Raw image with strong contrast stretch: the noise hides the actual detail along the lunar terminator. 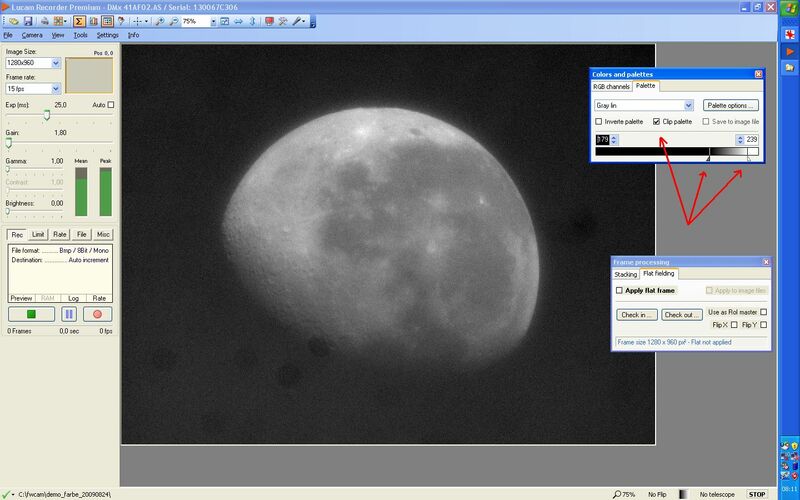 Stacking images reduces the noise and the actual detail along the lunar terminator becomes visible. Digital contrast enhancement is a powerful tool in live observation, but we should always get the most from the non-digital world first. A red filter was used to drastically improve contrast between the moon and the blue sky, compared to the (deliberately stupid) blue filter. With contrast stretching, the image is already better then anything we got through the blue filter, when looking at the detail along the lunar terminator. Filters are powerful tools! Together with image stacking (and a new flat field, as we are using a different optical setup), we can see even fainter detail along the terminator. Analog measures such as filters and baffles combined with the digital methods in the Lucam Recorder allow a great leap in the visibility of low contrast detail. In realtime!